Today is my babies' first day of school. Of course, they are no longer babies. Big Sis is starting her first day of fifth grade, her last year of elementary school. 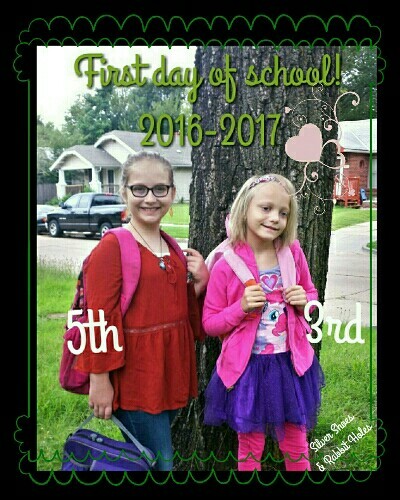 Little Sis is in third, and joins her sister in the "big kid" half of the school. It seems like only yesterday that I dropped my oldest off for her first day of kindergarten. So nervous, so excited. 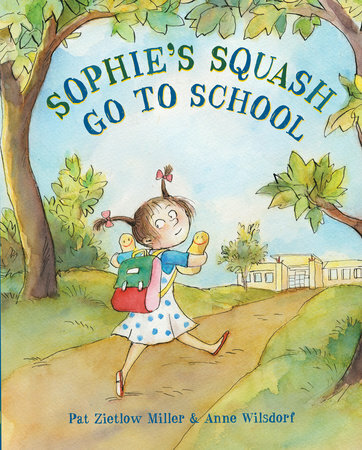 The book Sophie's Squash came out when Little Sis was in kindergarten. She was so shy and quiet in those days, at least to those of her who didn't know her well. She latched on to that book, I think, because she identified with Sophie, a creative little girl with a big imagination. I love that book so much I blogged about it TWICE (here and here). So I'm so happy to share a new Sophie book on this first day of school. illustrated by Anne Wilsdorf. Schwartz & Wade, 2016. When we last saw Sophie, she was holding Bernice's offspring, two new butternut squash named Bonnie and Baxter. Now, it is Sophie's first day of school. Sophie's parents insist she will have fun and make new friends. Sophie is determined. She will not have fun, and Bonnie and Baxter are the only friends she needs. Most of the children fail to understand. One even asks Sophie if they can eat them. But one little boy, Steven Green, wants to be Sophie's friend. He tries very hard, but Sophie isn't very nice to him. He introduces Sophie and the squash to his best friend, a stuffed frog named Marvin. Sophie still doesn't care. Her parents try to reason with her, but she won't budge. She has no time for other children. Bonnie and Baxter are the only friends she needs. Several times, she almost makes an effort. Poor Steven asks if he and Marvin can play hopscotch with her, but she is rude. Then the time comes to say goodbye to the squash. They are old and past their prime, so Sophie buries them in the garden. She draws a picture at school. Steven wants to see, but Sophie doesn't want to show him. He grabs the picture, and accidentally tears it. Sophie is unforgiving. At school, Steven leaves Marvin and an envelope in her cubby. She ignores it until it disappears. Later, her dad finds both in her backpack. Inside the envelope, Steven has enclosed a picture he drew of Bonnie and Baxter, and a packet of seeds. "Then she took Marvin outside and sat by Bonnie and Baxter. And thought some more." Sophie finds Steven at school. "Your frog had a great idea." The teacher helps the class plant seeds in pots. They start to sprout. "See?" Sophie told Steven. "Sometimes growing a friend just takes time." Reading this again as I photographed it, I really felt for little Steven. He just wanted a friend, and saw someone with whom he could identify. Sophie isn't very nice, but sometimes, young children are not nice, especially if they tend to live inside their own heads, like Sophie. My own Sophie-ish kiddo is more of a people person than her big sister now. It's so funny how things change. Here's our obligatory first day of school picture. Fall is just around the corner! I just read the first Sophie's Squash this week! Not sure how I missed it. And now I want to read this one! I saw it on Amazon the other day, but the title was really bugging me--My brain did not grasp that there were two squash involved so it was actually grammatically correct. I actually love that Sophie was quite rude to Steven! It is an unpleasant truth of childhood that kids can be pretty mean. Sometimes you see it in the supporting characters, but not as often in the main character. And yet, misbehaving kids are generally the kids favorites--Pippi, Pigeon, Ramona, David, Junie B. Will have to check this out! I am looking for beginning of school books to read with kids at the library, so I might add this too the list! We really enjoyed it. And Sophie's behavior does give you a lot to talk about with the little ones! It's so crazy how fast time flies. It's just so true. And we love these books so much, too.